This book gives the stories of forty real estate investors (individuals and couples) who have purchased over $80 million of residential property in three years, yet they include solo mums, church ministers and housewives. Many of the individuals concerned have overcome hardship before deciding to create financial security and choosing to invest in residential real estate as the way to do this. The book is certainly inspirational. My partner and I both read this book while we were on holiday, and his comment was that it made him want to buy more properties when we got back home. We haven’t done this yet, but I am sure we will in the future. There is a real mixture of people profiled and some people you will relate to more than others. The mixture of New Zealand and Australian investors is appealing. It will no doubt give the book a market in both Australia and New Zealand, but it is also really interesting to learn more about the similarities and differences in property investment between the two countries. At the end of each profile the investors give the reader their top ten tips. This is a nice touch. A lot of the tips have similar themes. That is the wording of the tips are not identical but the messages coming through tend to get repeated. This is not a criticism, we get to see what the common themes are. For example, the need to have good structures comes through frequently as does the need to have a good professional team. Conversely, and interestingly, there are also a few tips that contradict each other. For example, some people advocate the use of property managers while others manage their own properties. A lot of the tips are quite general in nature, but others are quite specific. The book includes an audio CD that includes interviews with six property investors. The CD is a good complement to the book, with similar stories to those actually contained within the book. The majority of investors profiled and have been in real estate for relatively short periods. For example, the feature story (or profile) looks at two female Auckland based accountants who have been investing in property since early in 2004. As everyone knows property prices in New Zealand and Australia have markedly increased over the last few years. To get more balance, it would have been beneficial to have profiles of more people who had been in the property investment market for ten or more years. (I would have also liked to see a couple of profiles of people who decided that property investment wasn’t for them. What can we learn from those that haven’t succeeded?). There are a few people profiled who have been in the property market for longer, and also some stories included details of earlier mistakes that people had made. The majority of people profiled are also not ‘rich’ yet. They are building property portfolios, yes, but are not at the stage where they can live of their rental properties. Some people have come a lot further than others, which is probably appropriate as you benefit from reading a real mixture of experiences. The approaches taken by the investors also vary, with some people using the traditional buy and hold strategy, and other using a variety of what could perhaps be seen as more risky strategies. I found the book really easy to read. Although it looks like a big heavy book, this is misleading as there is good use of white space, and there are even some photos in a most of the profiles. Reading it on holiday didn’t feel like hard work at all! 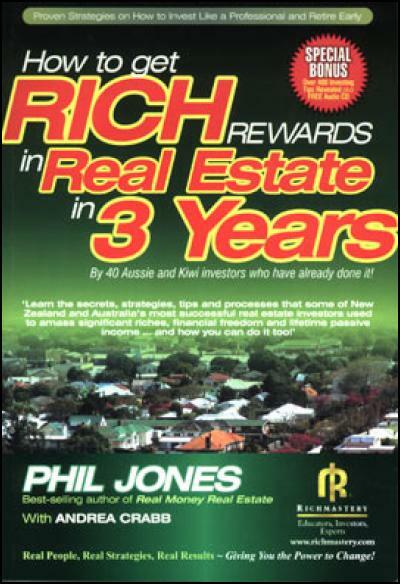 I think it is important to realise that “How to get Rich rewards in Real Estate in 3 Years’ is a Richmastery promotional tool before you buy the book. I am not saying that you shouldn’t buy it, but go into it knowing what you are buying. As members of the Manawatu Property Investors Association we found it really interesting to see included and to read profiles of some fellow members. I am sure members of other Associations around New Zealand will also recognise some of the people profiled. This does make the reading experience more meaningful. Overall, I really felt that the main benefit of the book was inspirational, seeing how ordinary New Zealanders and Australians were choosing to invest in real estate. I don’t think there was enough depth in actual techniques that you could rely just on this book to get rich rewards from real estate. However, as many of the people profiled said, and I totally agree, it is important to read a variety of books and to attend educational events. Even if you just pick up one good point from any book, or CD, or meeting, or seminar, it will have been worth the effort. I would definitely recommend this book as an addition to your real estate library.